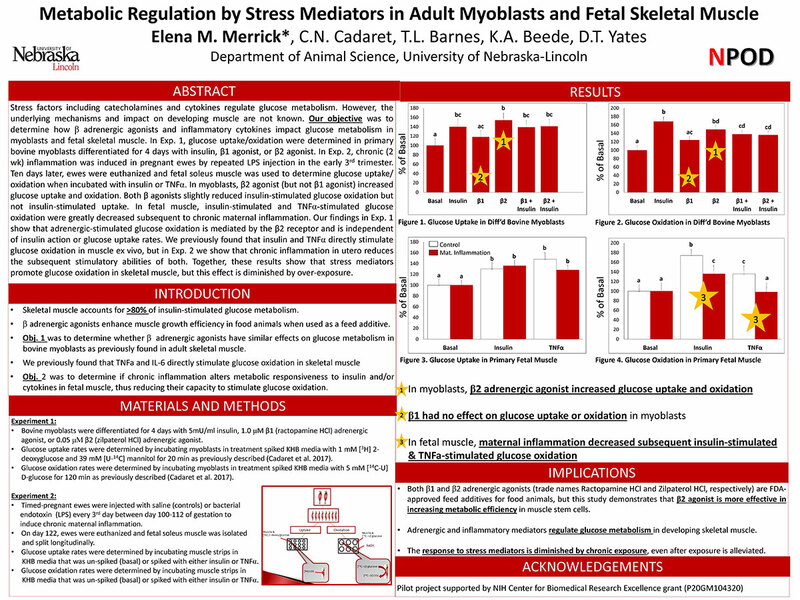 We study metabolic fetal programming related to maternal stress, placental insufficiency, and intrauterine growth restriction. In humans and companion animals, IUGR-born individuals (~10% of all US-born babies; ~25% worldwide) are at much greater risk for obesity, diabetes, hypertension, and other metabolic disorders that shorten life expectancy and reduced quality of life. 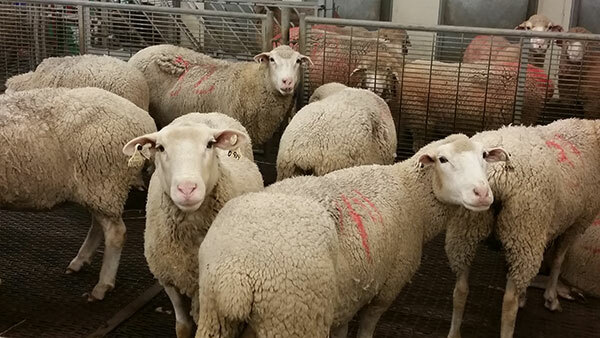 In food animals, IUGR leads to less efficient growth and poorer carcass quality, which reduces the financial sustainability of meat animal production. 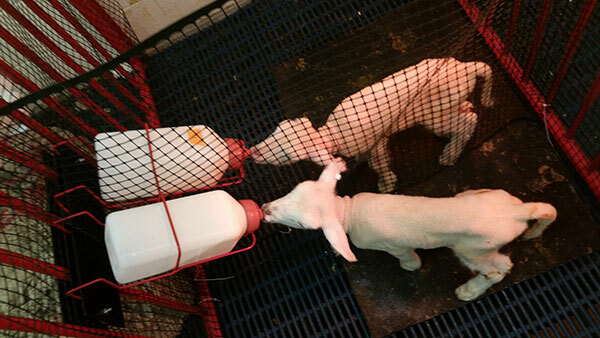 Our lab utilizes pregnant sheep and rodents as physiological models for humans and ruminant livestock species. We have developed research techniques to allow us to measure fetal physiological responses to maternal stress factors in real-time over the last trimester of pregnancy. In addition, we can study glucose metabolism in live animals, primary tissue samples, and cells cultures. A large factor in metabolic homeostasis is proper skeletal muscle growth, and we have developed ex vivo and in vitro protocols for measuring functional capacity of muscle stem cells, as well as microscopy and immunoblot techniques for determining muscle fiber dynamics. Our long-term research goal is to identify the developmental adaptations that occur in utero in response to maternal stressors and then use those findings to develop postnatal nutritional/pharmacological intervention strategies for IUGR-born offspring. Our approach encompasses investigation at 3 levels: the cellular/molecular level, the physiological system level, and the whole-animal level. The benefit of this approach is two-fold. 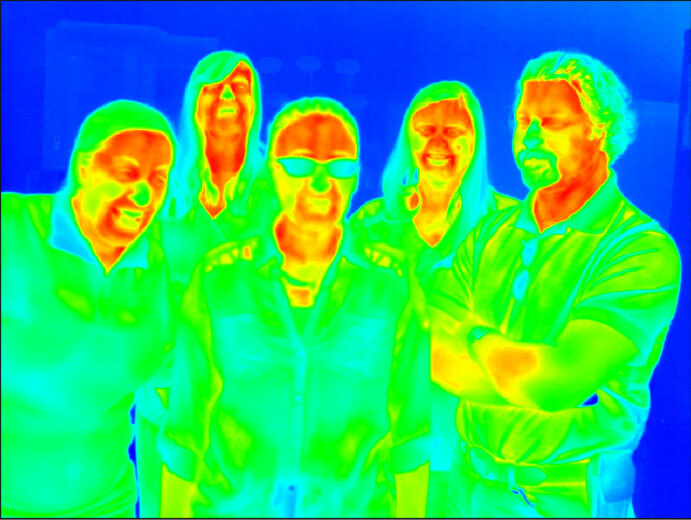 First, our findings generate a broader understanding of the physiological issues that we study. 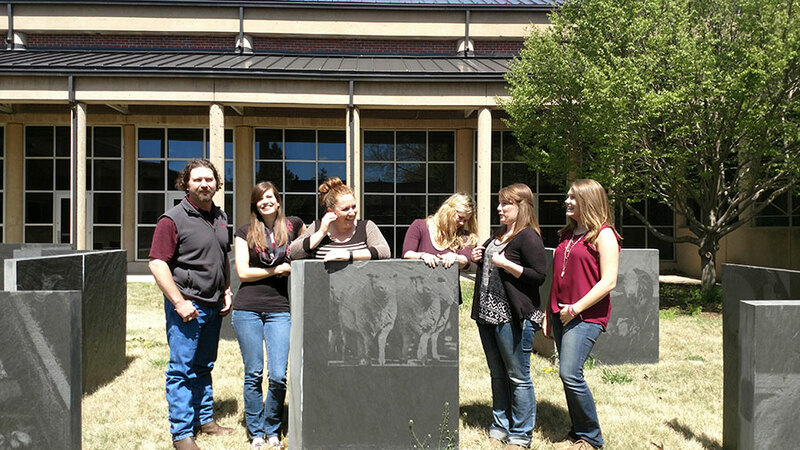 Second, our grad students and undergrads gain experience in a wider range of research skills. 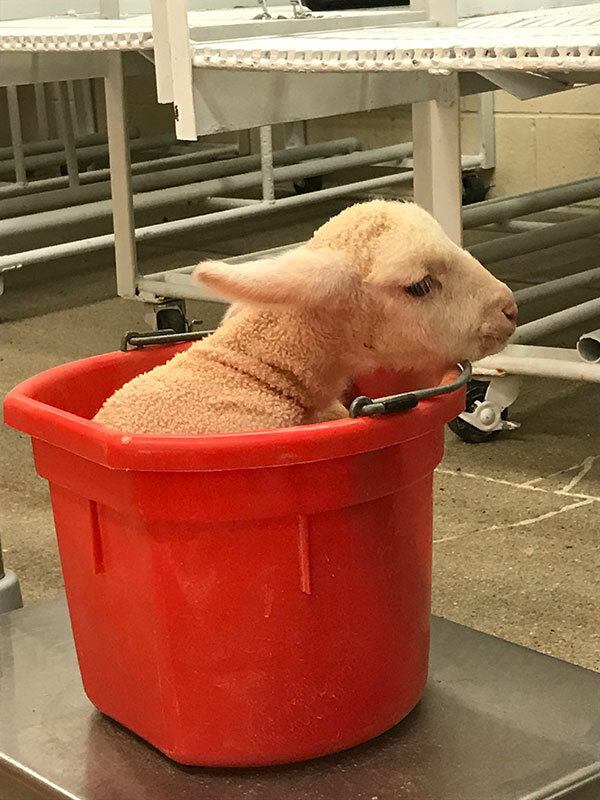 It would not be uncommon for a lab member to feed and weigh sheep, stain tissue sections for microscopy, change media in cell cultures, perform a hormone assay on blood samples, surgically implant fetal femoral catheters, measure gene expression in isolated RNA, and attend a seminar by an internationally-recognized leader in the field all within a normal week. 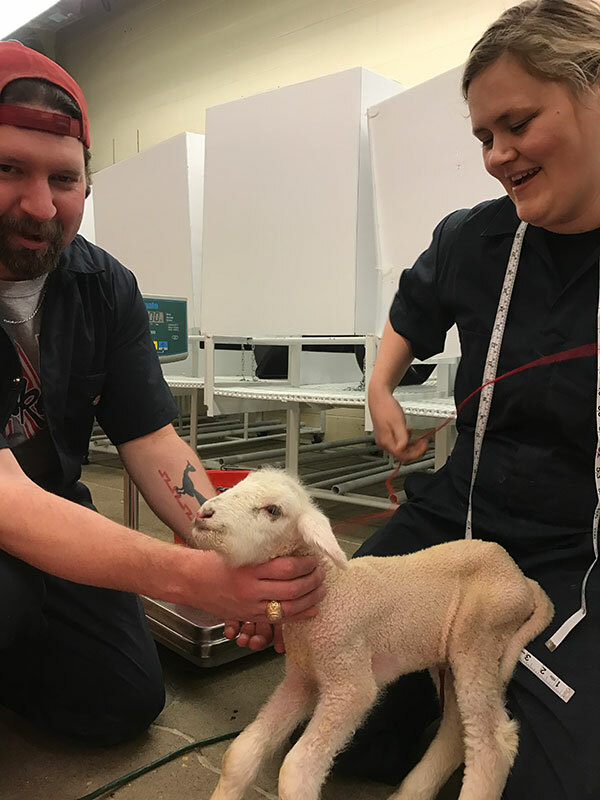 In addition, our grad students have the opportunity to develop teaching and lecture skills by acting as teaching assistants for Dr. Yates' Animal Physiological Systems course taught each Fall. TAs get hands-on experience in developing teaching materials and guiding 20 junior-level undergrads through hands-on learning activities once a week. 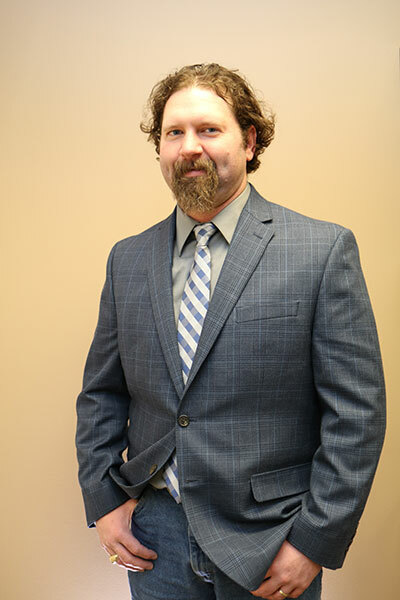 Dustin Yates, PhD – Dr. Yates was born and raised in the small “Cotton & Cattle” town of Weinert, Texas in the west-central part of the state. He graduated from Texas A&M University in 2004 with a BS in animal science. 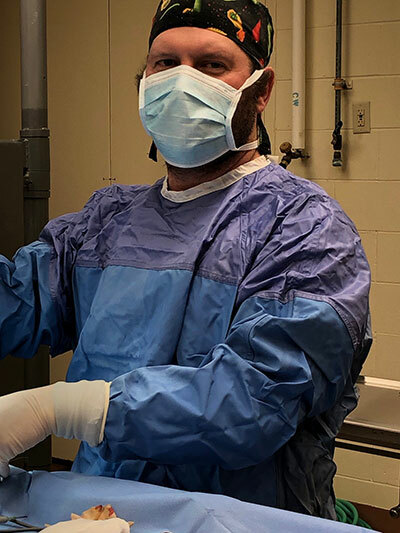 After managing the graveyard shift in a large feedmill for a year, Dr. Yates returned to school at Angelo State University in San Angelo, Texas and earned a MS in reproductive physiology with Dr. Mike Salisbury in 2006. 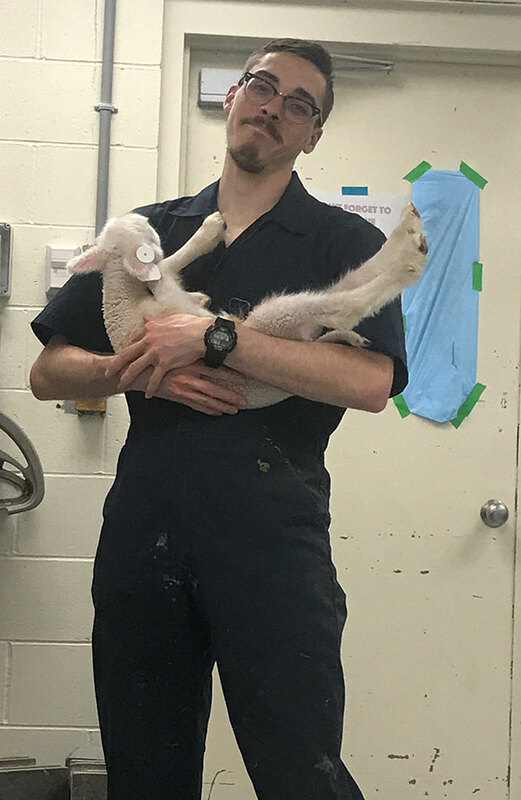 His Master’s thesis examined the mitigating effects of seaweed extract on heat stress-induced subfertility in male goats. Dr. Yates then joined the lab of Dr. Tim Ross at New Mexico State University and graduated with a PhD in reproductive physiology in 2009. His dissertation produced eight manuscripts related to stress-induced male and female subfertility. In 2010, Dr. Yates began a four-year postdoctoral research fellowship in the lab of Dr. Sean Limesand at The University of Arizona. During this time, Dr. Yates gained many of the research skills and techniques that his lab uses today. 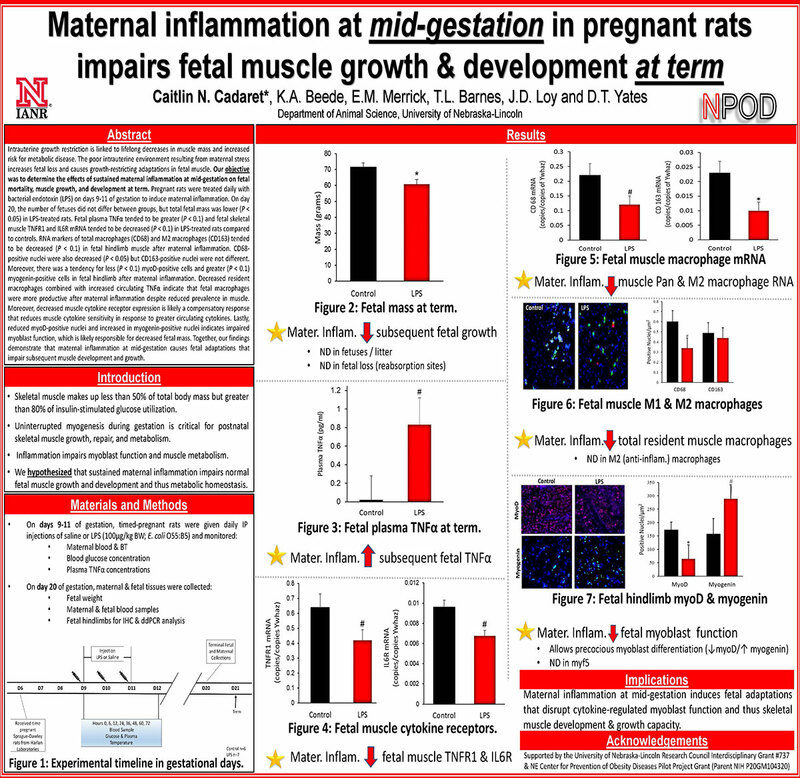 His research with Dr. Limesand produced several key new pieces of information regarding fetal programming of muscle growth and metabolism, as well as several novel laboratory and surgical techniques for studying fetal physiology. In March of 2013, Dr. Yates began his current faculty position at University of Nebraska - Lincoln as Animal Stress Physiologist in the Animal Science department. He is also a member of the Nebraska Center for Prevention of Obesity Diseases (NPOD). Dr. Yates and his wife reside in nearby Eagle, NE and have two wonderful young children, a couple dogs, and a 1962 Cadillac Fleetwood. 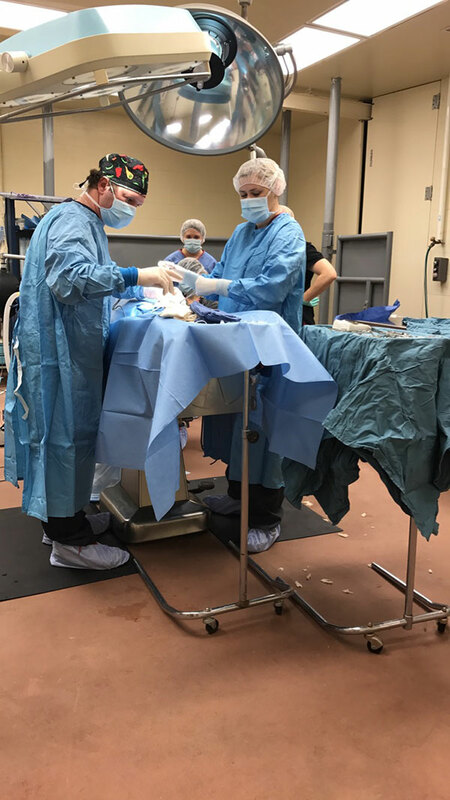 Kristin was born in Kearney, Nebraska and after graduating from high school attended University of Nebraska - Lincoln with the original goal of attending vet school. 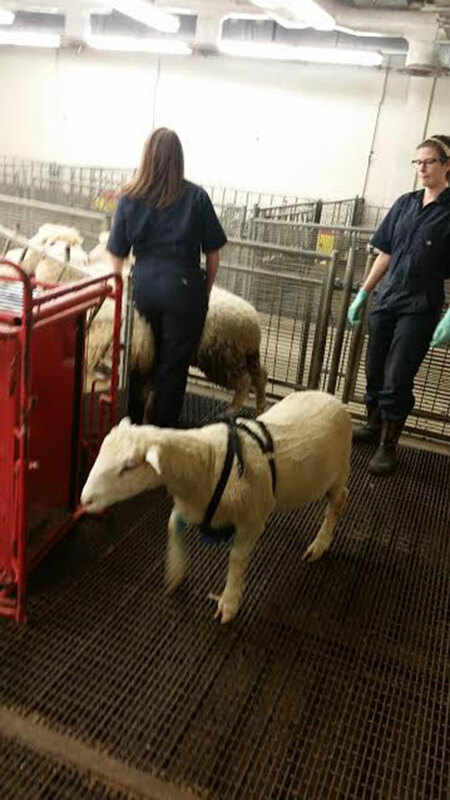 Kristin completed her Bachelor's Degree in Animal Science in 2010 and then took an internship at Schering-Plough Animal Health for eight months. Following that she decided to continue her education in Reproductive Physiology and headed back to University of Nebraska - Lincoln to work on her Master’s degree with Dr. Jennifer Wood. 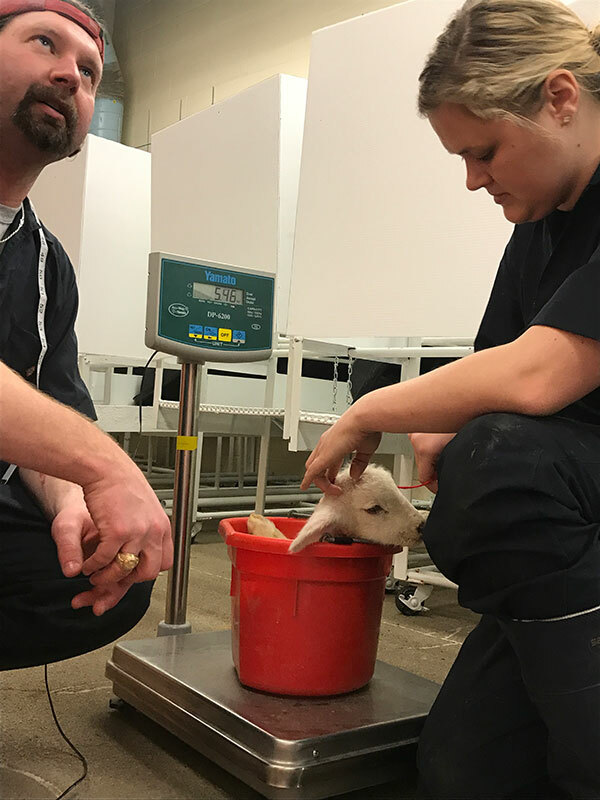 After completing her Masters work in 2013 which focused on the effects of maternal obesity on adipose and muscle development in the mid-gestational mouse, Kristin took a job at GeneSeek as a laboratory technician in their veterinary diagnostics division. 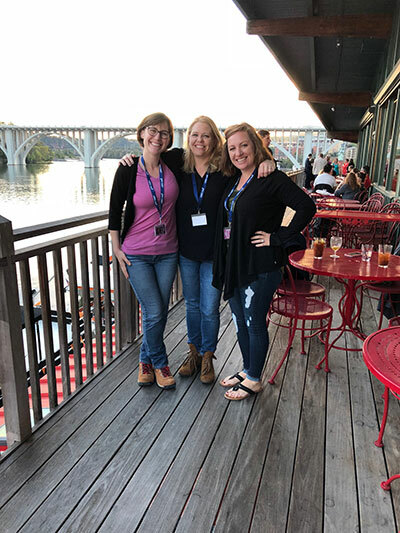 After one year at GeneSeek, a position opened up at the University with Dr. Yates so Kristin got the opportunity to get back to research which is what she loves to do. Kristin is in charge of the daily activities of the laboratory as well as training laboratory skills to the graduate and undergraduate students. Kristin along with her husband Matt have two daughters, Emma and Nora, and two dogs Cruz and Dezi. In her free time she helps manage their family business Beede Outdoors. Joslyn was born on a 2-acre farm just outside the city limits of Las Cruces, New Mexico were she developed a passion for the agriculture lifestyle growing up with cattle, sheep, and pigs. 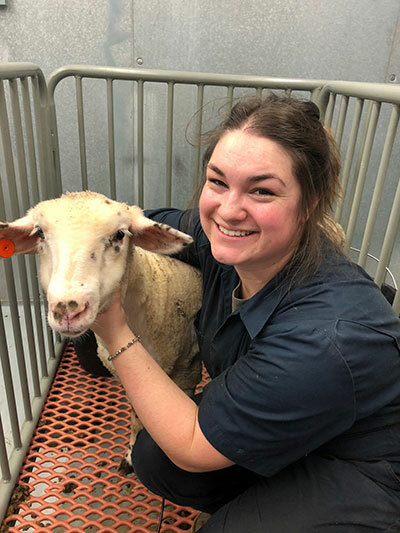 Having a desire for a career in veterinarian medicine, Joslyn attended New Mexico State University earning her Bachelor’s Degree in Animal Science in 2015. During her undergraduate career she found a passion for research while working for Dr. Hallford, and decided to switch paths and pursue a master’s degree at New Mexico State University. 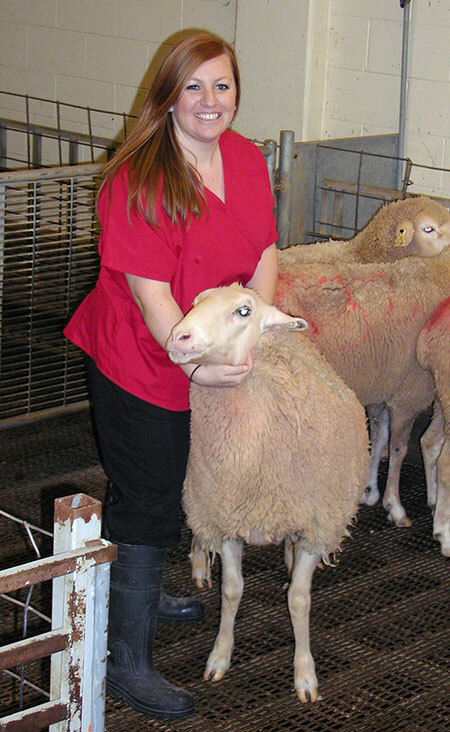 During her master’s program Joslyn served as the wool judging coach and a teaching assistant for the introductory animal science class. 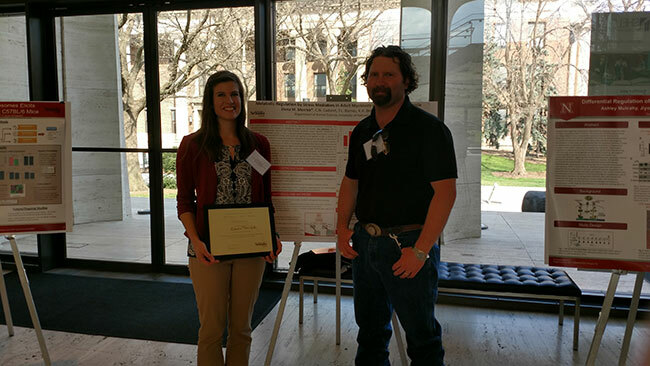 In regards to her research, she investigated the mechanisms involved with maternal stimuli during fetal development on beef progeny performance. 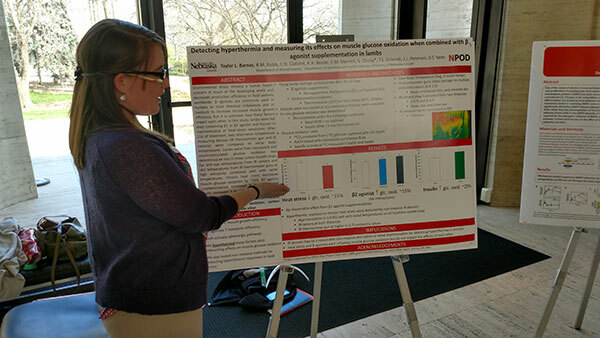 At the end of her masters Joslyn’s interest in fetal programming only grew, and she sought out a greater understanding of the underlying mechanisms that affect animal performance based on insults received in-utero, which led her to University of Nebraska - Lincoln in January of 2018 where she is currently co-advised by Dr. Yates and Dr. Mulliniks. Shawna Clement grew up in Malcolm, Nebraska and spent her childhood doting on a menagerie of small animals, which included dogs, cats, and various rodents, reptiles, and arthropods. She earned bachelor's degrees in English and sociology from Doane College. 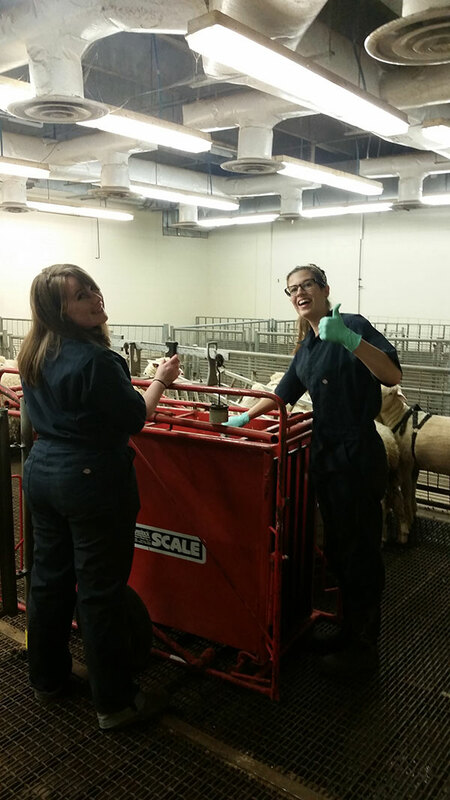 More recently, Shawna attended Nebraska College of Technical Agriculture and became a licensed veterinary technician. While in technician school, she worked as a tutor and developed a profound love of teaching. 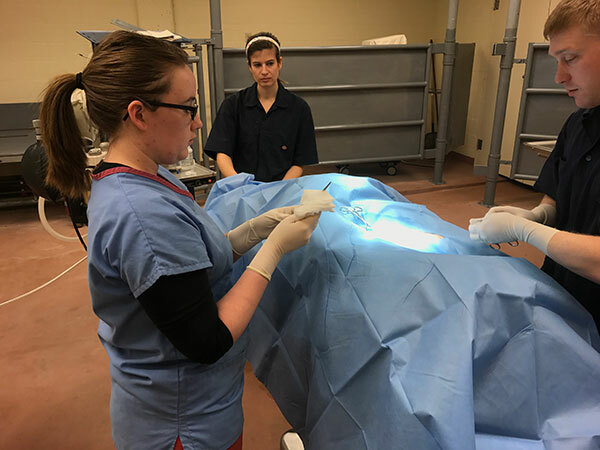 Thus, when presented with the opportunity to become an instructor in the gross anatomy lab for University of Nebraska - Lincoln's Professional Program in Veterinary Medicine, she leapt at the chance. She is now in her sixth year of teaching anatomy, medical terminology, and radiology. Her most recent degree is a Masters of Applied Science, for which she wrote a digital feline dissection guide for veterinary technicians. Shawna is grateful to be pursuing her PhD in Dr. Yates' lab. Her research will involve the implementation and testing of elementary through high school science literacy outreach materials and techniques. 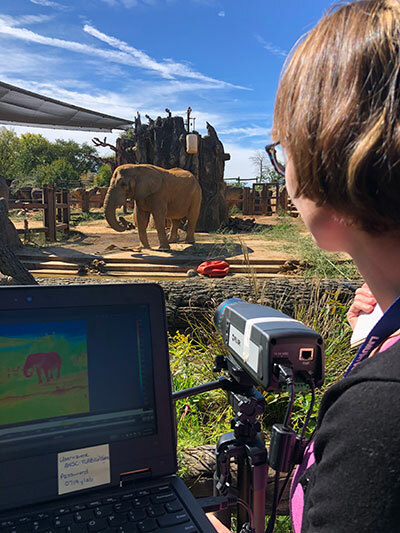 Additionally, she will be evaluating infrared imaging as a non-invasive means of detecting heat stress in zoo animals, particularly elephants and giraffes. Robert was born in Denver, Colorado before moving to a small acreage just outside of Lincoln, Nebraska in 2001. He grew up in rural Nebraska attending District 145 schools surrounded by his own pets, and working with the livestock of his neighbors. Robert found his true passion for animal agriculture and care in 2013 when he spent the Summer working as Wrangler at YMCA Camp Kitaki. Upon graduation from Waverly High School that same year he began his undergraduate degree at The University of Toronto. 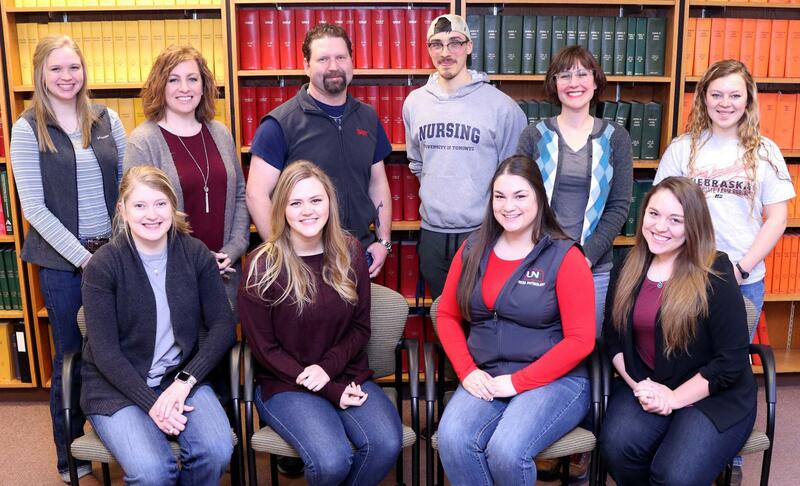 In May of 2017 Robert received his Honors Bachelor’s Degree with a double major in Animal Physiology and Health & Disease, and a minor in Immunology. During his final year of study Robert found himself drawn toward research in Comparative Endocrinology and Stress Physiology. 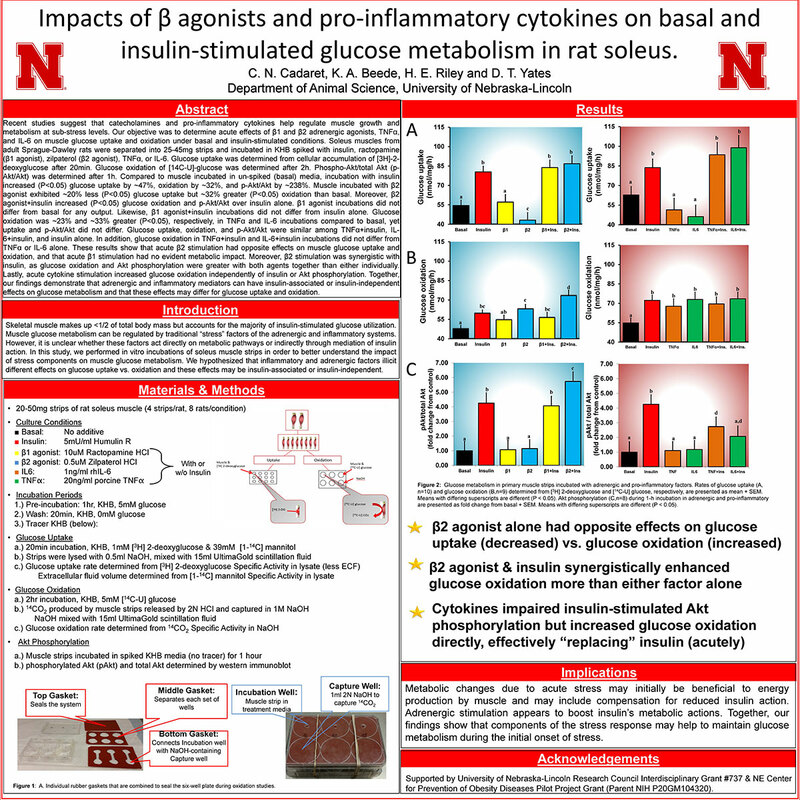 In June of 2017 he joined Dr. Yates’ laboratory, and began his graduate career at the University of Nebraska-Lincoln. 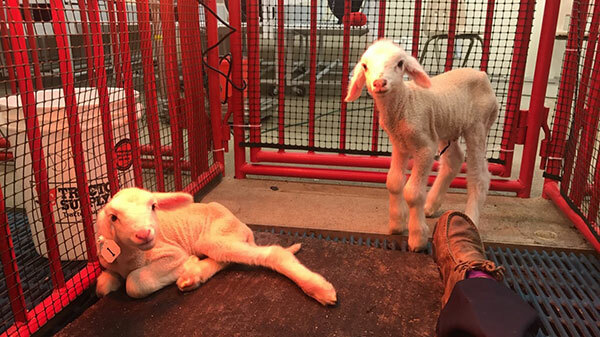 His current research involves the effects of maternal immunological activation and cytokine release on both fetal and lamb muscle development and metabolism. Upon completion of his Master’s Degree at University of Nebraska - Lincoln Robert intends to pursue a career as a research scientist and consultant for the United States government within the USDA, FDA, or NIH. Rebecca grew up in Vacaville, California on her family’s hobby ranch where she developed a passion for raising livestock. 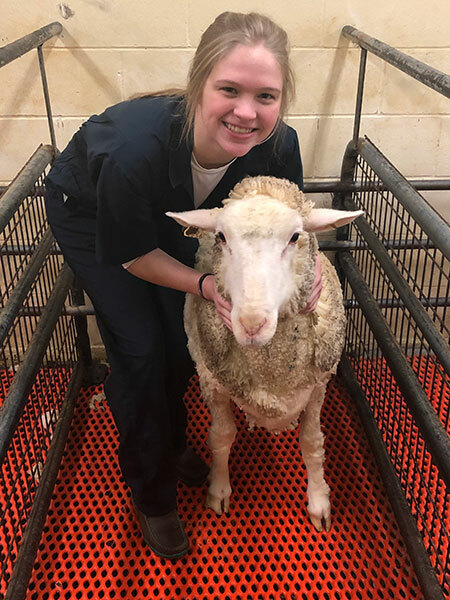 Her passion led to her involvement in FFA and the livestock show industry throughout high school and an opportunity to be employed at a custom butcher shop and commercial cow-calf operation. Upon graduating from high school, Rebecca attended California State University, Chico where she earned a B.S. 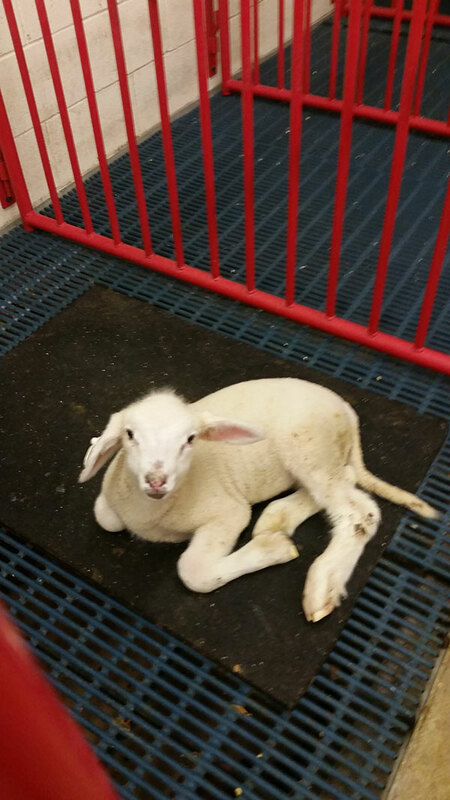 in Animal Science and a B.S. in Agricultural Business. 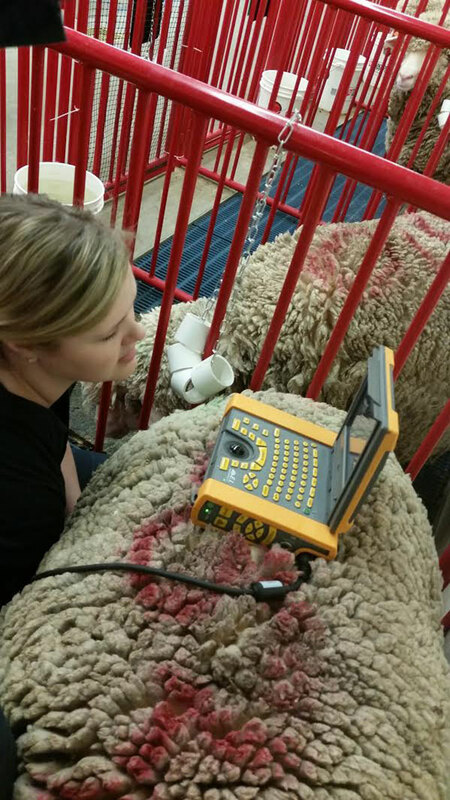 During her time at CSU, Chico, Rebecca was a Research Associate and Herdsmen at the University Farm Beef Unit. She held several Executive Board positions for the California Young Cattlemen’s Committee and the Chico State Young Cattlemen’s Association during her time as an undergraduate. Rebecca had the opportunity to work on several research projects and even lead a project during her junior and senior years. At the conclusion of the research project, she was able to present her research at WSASAS and several other meetings and classes associated with CSU, Chico. Rebecca was a member of the 2017 nationally ranked WSASAS Champion Academic Quadrathlon team. 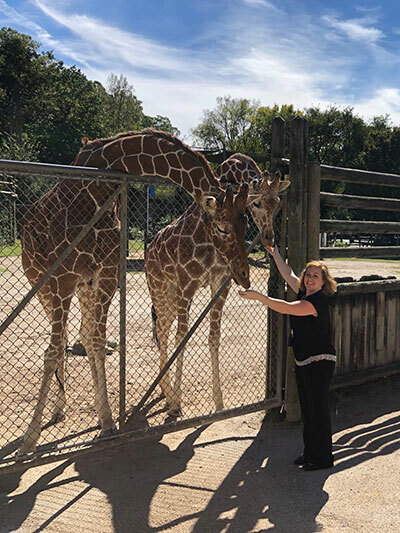 Rebecca’s passion for Animal Science Research and Education led to her decision to attend graduate school landing her in the Yates Lab at University of Nebraska - Lincoln. 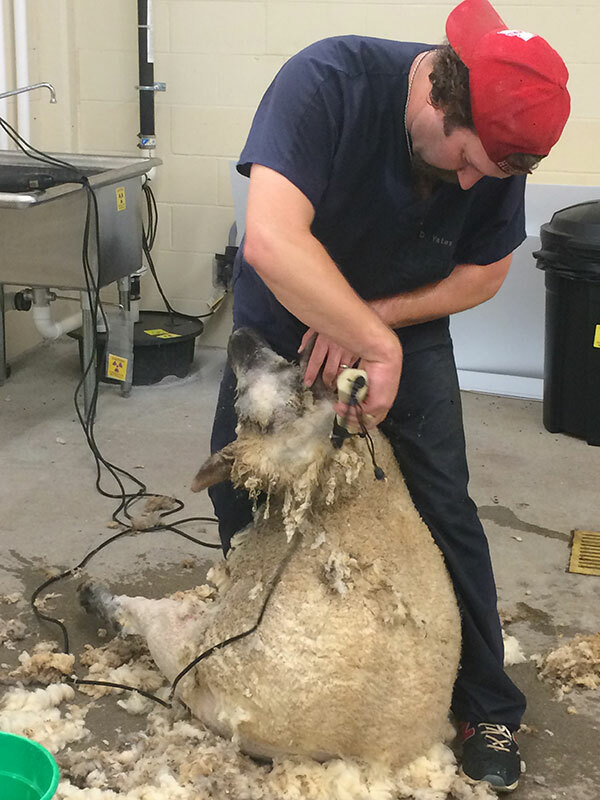 Rachel grew up in Ballinger, Texas where her family raised Rambouillet and Southdown sheep. 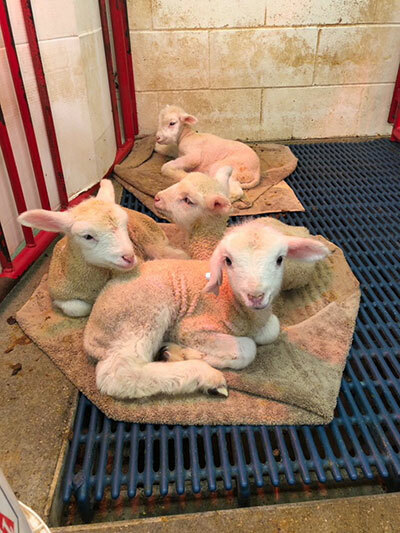 She was heavily involved in 4-H and FFA growing up where she primarily showed lambs and goats and competed in multiple judging events. 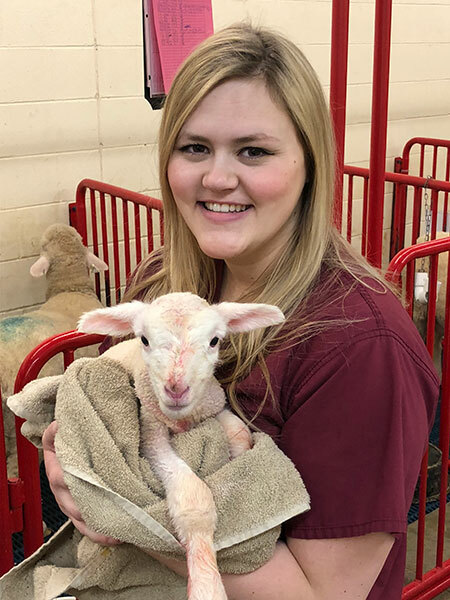 Her strong agricultural background is what has fed her passion for the livestock industry and what ultimately led her to Texas A&M University following graduation from Ballinger High School in 2015. 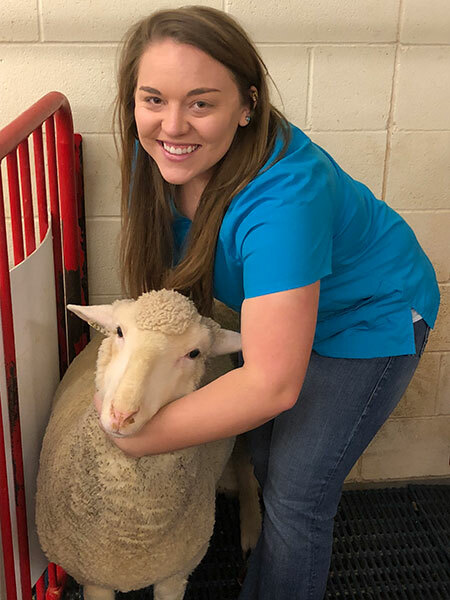 While at Texas A&M, she was a member of the 2016 National Champion Collegiate Wool Judging Team and served as the assistant coach for the 2017 Reserve National Champion Collegiate Wool Judging Team. In December of 2018 she graduated with honors with her Bachelors of Science Degree in Animal Science. Rachel's interest in research began throughout her last year at TAMU where she served as an undergraduate research assistant in a reproductive physiology lab where they studied the effects of gene editing on male fertility using mice as a model. 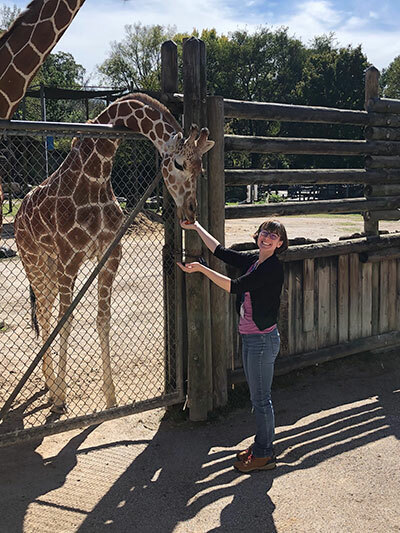 Her interest in not only research with the use of large animal models but also in overall physiology is what led Rachel to the Yates lab. Morgan grew up in Arnold, Nebraska on a small family ranch. While growing up on the ranch, she helped take care of her family's horses, cattle, cats, and dogs. In doing so, Morgan discovered a passion for animals, especially cattle and horses. 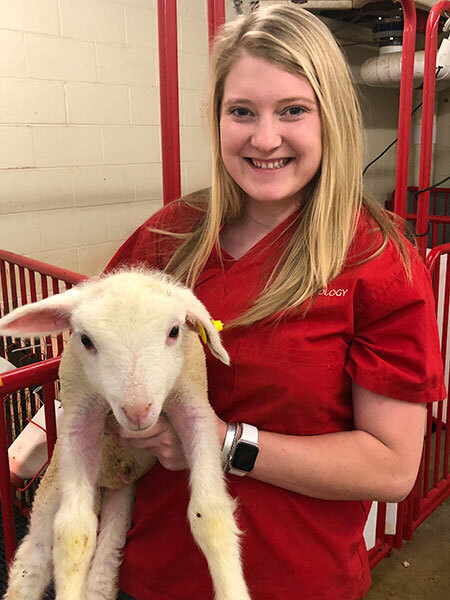 After graduating from Arnold Public High School, Morgan decided to pursue an undergraduate degree in Animal Science with a Veterinary Medicine option at the University of Nebraska Lincoln. She is a member of several clubs including University of Nebraksa -Lincoln Block and Bridle, Collegiate Farm Bureau, and University of Nebraksa -Lincoln Barbell Club. Morgan is expecting graduation in May of 2020 and plans to attend Vet School to become a large animal vet. 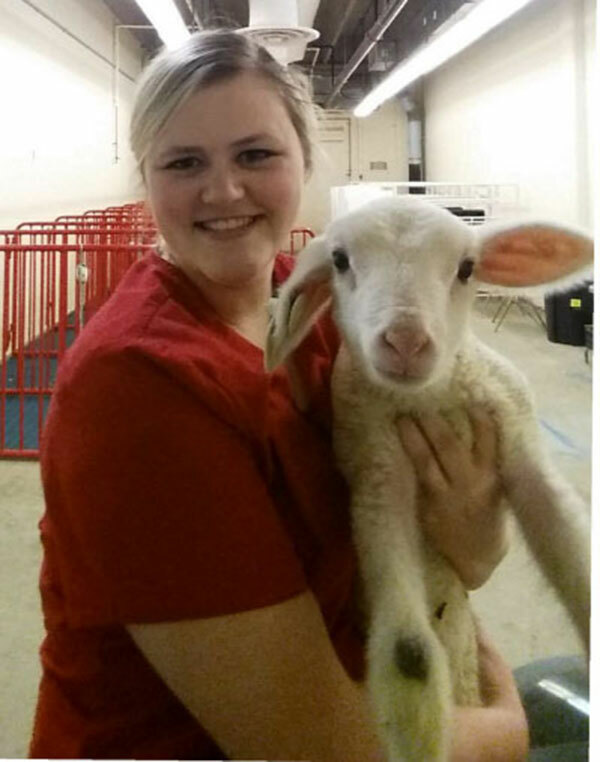 Her ultimate goals is to move back to rural Nebraska to practice veterinary medicine. Micayla is a sophomore from Olathe, Kansas. 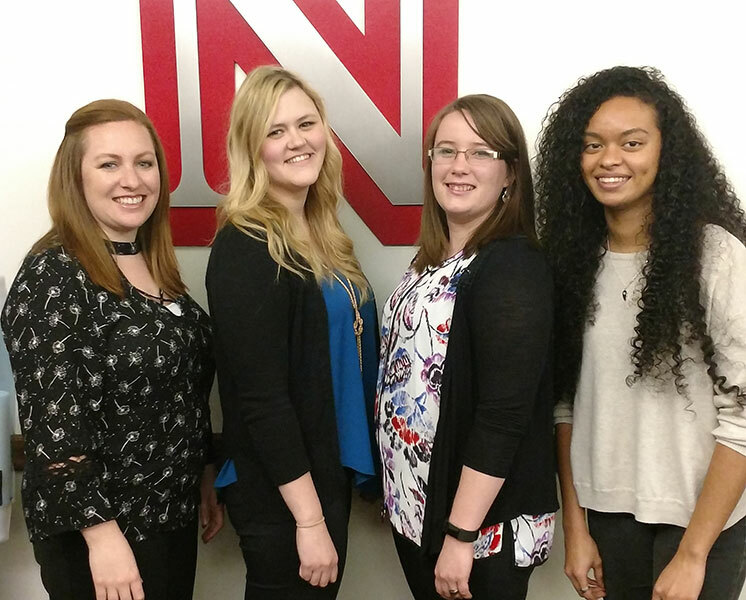 After graduating from Olathe Northwest High School, she decided to study animal science at University of Nebraksa -Lincoln. Along with majoring in Animal Science, Micayla has minors in agribusiness and grazing livestock systems. She has been passionate about all animals, especially horses, for as long as she can remember. Her extended family's cattle operations and her horses are what led her to finding a passion for nutrition. 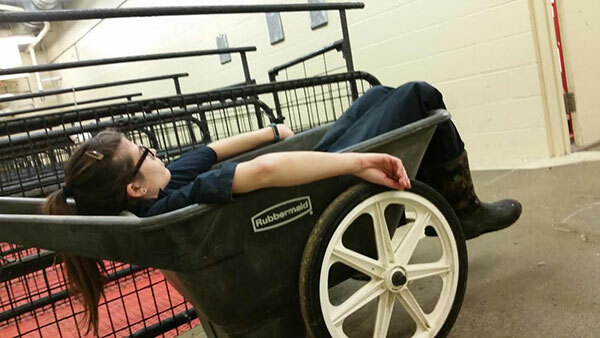 Micayla is a member of the University of Nebraksa -Lincoln Equestrian Team and Block and Bridle. Taylor Barnes, MS - Taylor grew up in Gretna, Nebraska surrounded by animals both large and small. She showed horses and other species in 4-H which sparked a passion for animal science and teaching at an early age. 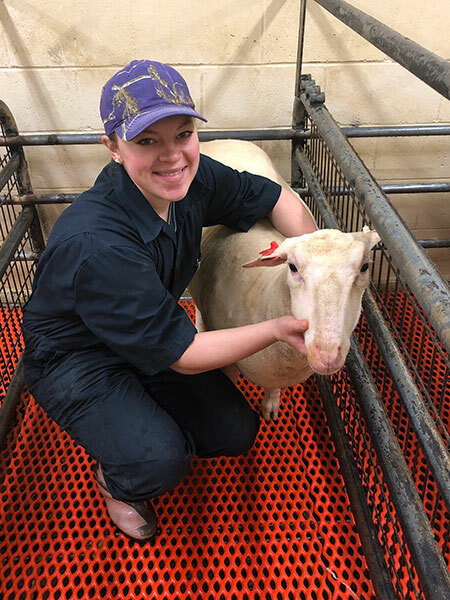 After two years at two other colleges, she made the move to University of Nebraksa -Lincoln to study animal science which ended up sparking an interest in physiology classes. She had the opportunity to be a teaching assistant for three of those physiology classes. 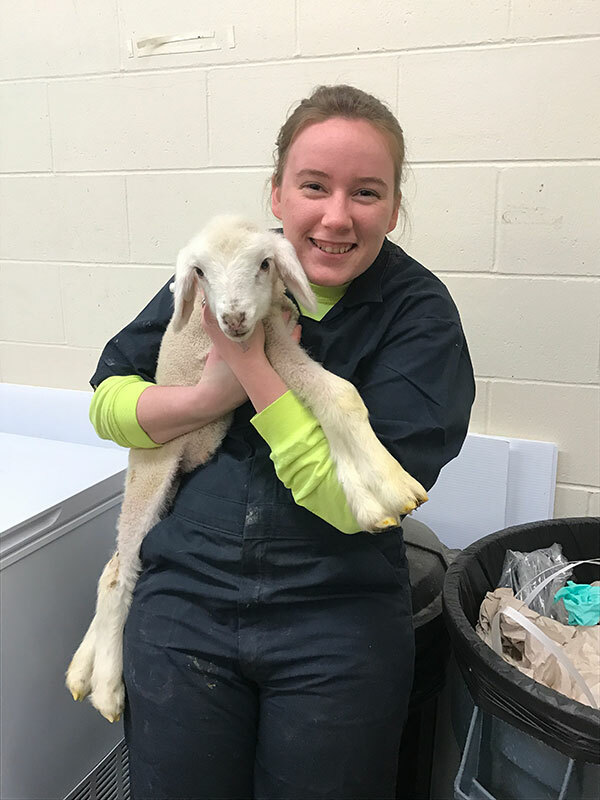 After graduating with her Bachelor's Degree in Animal Science in May 2016 she joined Dr. Yates and Dr. Jessica Peterson's labs to earn her Master's degree in 2018. 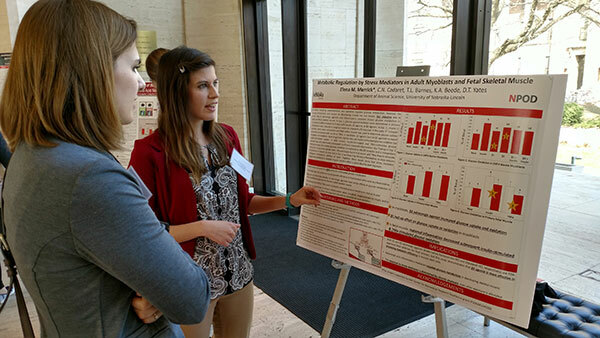 Her research involved looking at the effects of Zilmax and Ractopamine supplementation on muscle growth and metabolism. Taylor is currently pursuing her PhD at Texas A&M with the goal of obtaining an academic teaching appointment. Marytza AbebeI, BS - Marytza was born and raised in Lincoln, Nebraska. 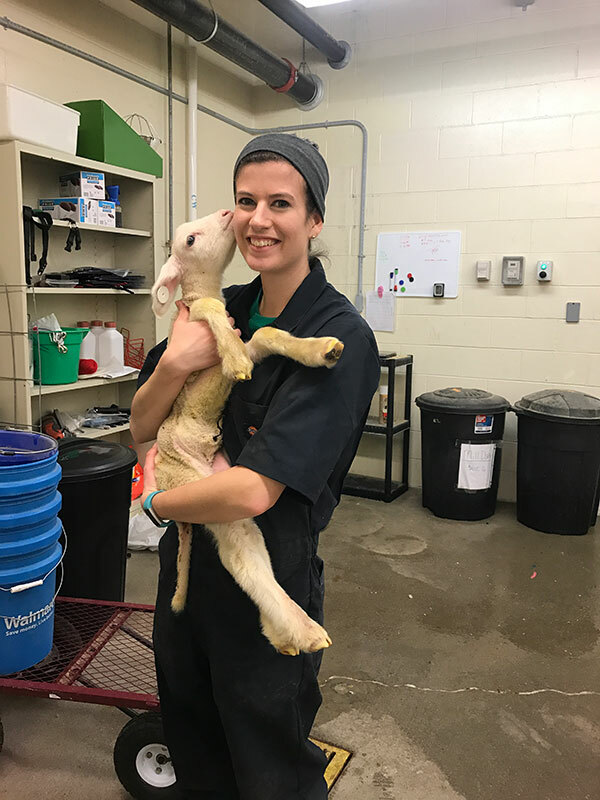 She has had a passion for animals since before she could remember and after graduating from Lincoln High School she decided to study at University of Nebraksa -Lincoln to pursue her dream of become a veterinarian. 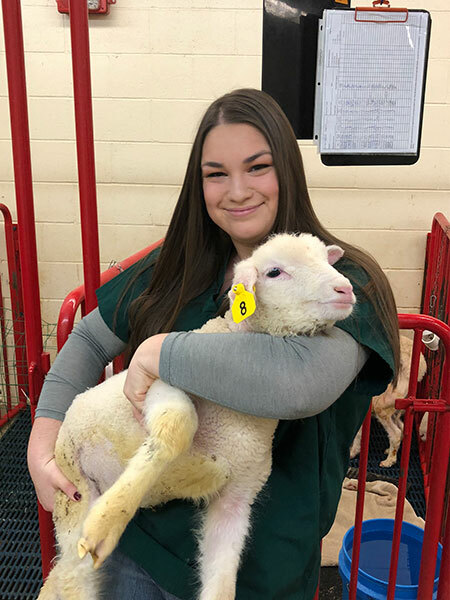 Marytza graduated from UNL in May of 2018 and will attend Vet school at University of Nebraksa -Lincoln in 2019 with the goal of specializing in exotic animals. Sophia Lentfer (BS expected 2020)- Sophia is from Firth, Nebraska where she comes from a background showing pigs and sheep in 4-H and FFA. Sophia graduated from Norris High School and is currently a freshman with an Animal Science major. She decided to study at University of Nebraska - Lincoln because of the programs they offer as well as it being close to home. Sophia is on the University of Nebraska - Lincoln Meats Judging Team and in the Kappa Delta Sorority. She plans to continue to pursue her bachelor's degree with a goal of staying heavily involved in agriculture. Elena Merrick, MS -Elena grew up in the rural community of Danvers, Illinois. Elena began her college career at Eastern Wyoming College in Torrington, Wyoming where she received her Associate’s Degree in Animal Science. 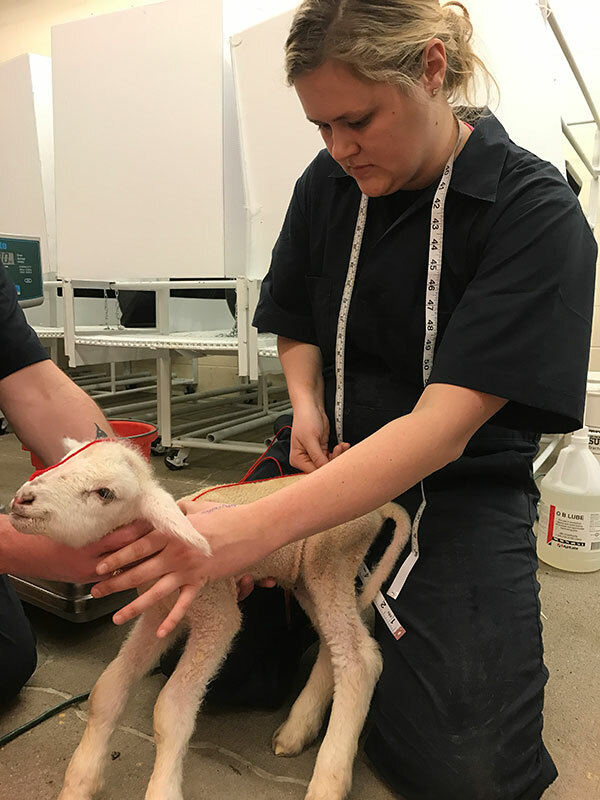 After, she decided to move back home to Central Illinois and attend Illinois State University where she received her Bachelor’s degree in Animal Science in May of 2015. In August of 2015, she started graduate school at University of Nebraska - Lincoln in Dr. Yates’s lab. 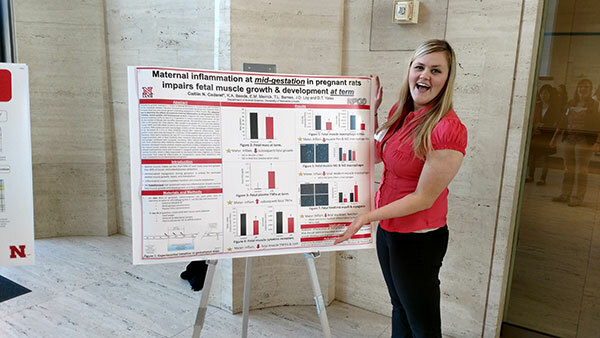 Her research involved the effects of maternal stress on prenatal muscle development and glucose metabolism. She received her Master’s Degree in August 2017 and has since took a job in Extension Outreach in Central Nebraska. Hannah Riley, BS –Hannah got a BS in Animal Science with a minor in Agribusiness in May 2016. She worked in our lab from 2014 through her graduation where she completed an Undergraduate Creative Activity and Research (UCARE) project. 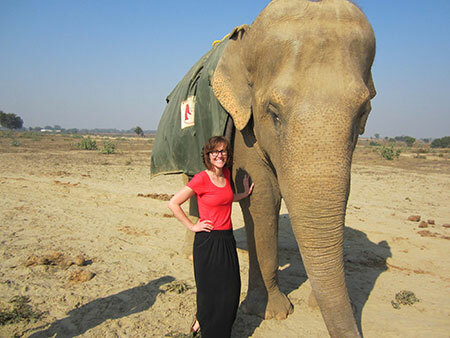 Hannah is currently pursuing her Master’s degree with Dr. Mary Drewnoski at University of Nebraska - Lincoln in heifer development. Yates DT, Petersen JL, Schmidt TB, Cadaret CN, Barnes TB, Posont RJ, and Beede KA. 2018. 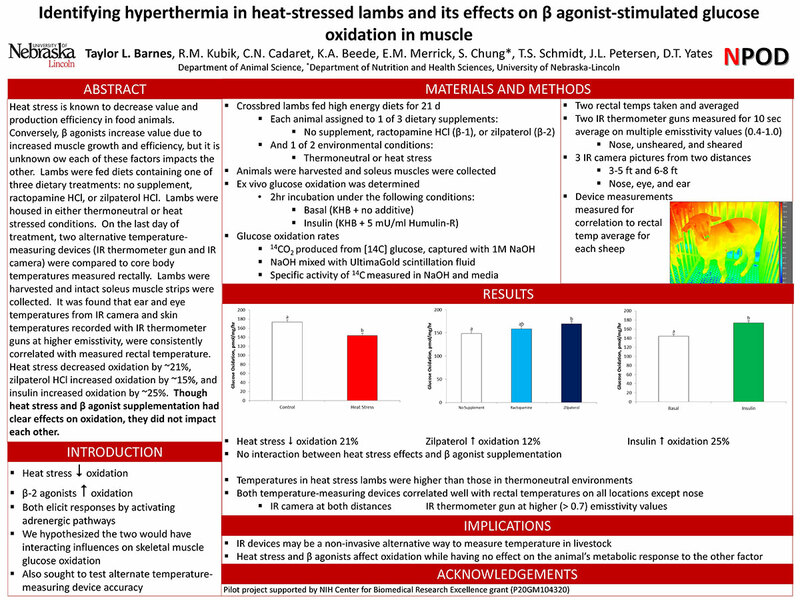 ASAS-SSR Triennnial Reproduction Symposium: Looking Back and Moving Forward-How Reproduction Physiology has Evolved: Fetal origins of impaired muscle growth and metabolic dysfunction: Lessons from the heat-stressed pregnant ewe. J. Animal Sci. 96(7):2987-3002. Cadaret CN, Yates DT. 2017. 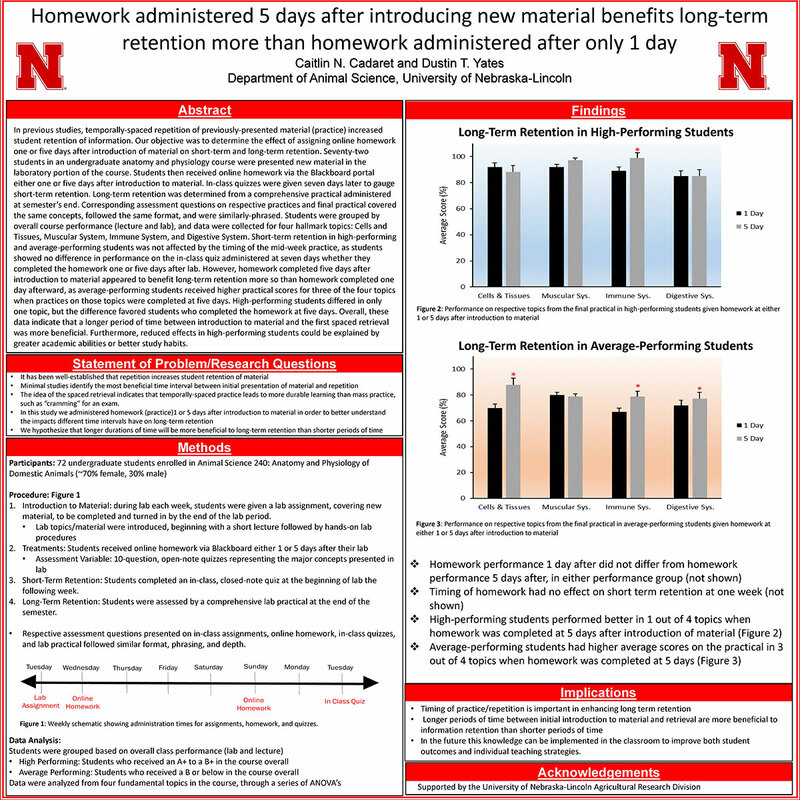 Retrieval practices are more beneficial to long-term information retention when spaced 5 days after introducing physiology topics compared to 1 day afterward. Adv. Physiol. Educ. (in press).